National Aeronautics and Space Administration and Arizona State University, 2006. Adapted with permission. 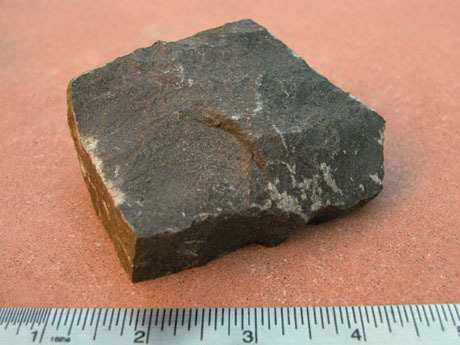 NASA will post a picture of your rock on the Web and give you a report on what kind of rock it is. NASA also will send you an official certificate and Mars sticker for your contribution. Your rock will be kept in a special collection where scientists from around the world can come to study it. Here is an example of a rock and its "fingerprint," otherwise known as its spectrum. Every rock has a unique fingerprint. This one tells us that the gray rock is basalt, which comes from volcanoes. It's really important that you send a rock from the ground in its natural setting. Avoid rocks that are decorative or used in landscaping as they could have come from other regions on Earth. Next, measure the rock to make sure that it is the right size. If it is the right size, and you're sure this is the rock you want to send, mark where you found the rock on the map. Take the rock home, or back to your class, and wash and dry it. Write a short paragraph describing the area where you found your rock. Send in your rock with the photographs, paragraph, and marked map to the address below. You also will need to send your name, age, and address (to send your certificate and sticker - your address is not released), including your city, state, and ZIP code if in the United States (and country if not). Optional information you can send may include the latitude and longitude of your sample site, the name of the geographic feature where the rock was collected, and your telephone number. NOTE: Only first names, ages, and cities will be listed on the Web.